What Continent Is Sweden In? Sweden is located in the northern region of the continent of Europe. Sweden is one of the three Scandinavian countries of Northern Europe. The Kingdom of Sweden is one of the Scandinavian countries situated in the northern region of Europe. Other Scandinavian countries include Denmark and Norway, but often Iceland, Finland, Faroe Islands, and Aland Islands are included. Scandinavia was initially used to refer to Scania in Sweden, and the population of the Scandinavian region originated from the North Germanic tribes. Danish, Norwegian, and Finnish form the Scandinavian languages and speakers of either of the languages can understand each other. 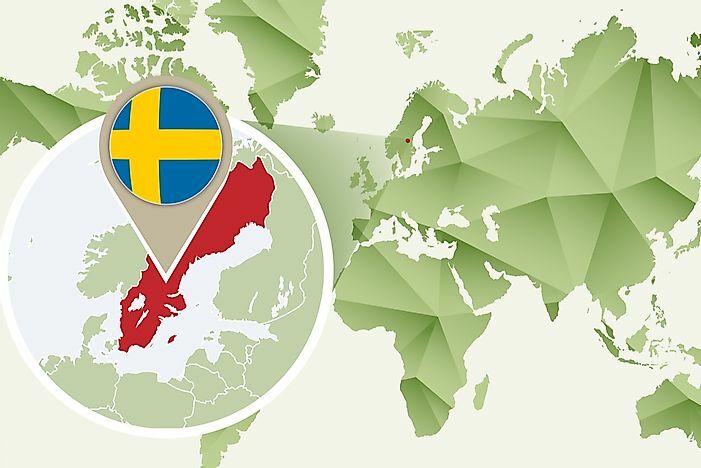 Sweden covers an area of 173,860 square miles, and it ranks third in size among the countries of the European Union. According to a national census in 2017, Sweden had a population of 10 million, of which 2.3 million were foreigners. The majority of the people live in the southern part of the country, and around 85% of the population lives in urbanized centers. The name Sweden was borrowed from Dutch in the 17th century to refer to Sweden as an upcoming great power. The name Sweden was derived from the old English word Sweopeod, which denoted people of the Swedes. The south of the country is mainly agricultural while the north is forested. The capital city is Stockholm and Sweden is considered a neutral country. Sweden joined the EU in 1995, and it is a member of the Council of Europe, Nordic Council, and the World Trade Organization. Sweden has a mixed economy, and it relies mainly on international trade. Sweden's biggest exports include hydropower, iron ore, and timber. The country has a high-income tax which sees that income is well apportioned across the society, this is at times referred to as the Nordic model. The country’s nominal GDP was $517 billion in 2017 with a GDP per capita of $51,603. The country ranks seventh globally regarding wealth as per GDP per capita. Sweden has a high standard of living coupled with a good health sector and a good education system due to the equal distribution of wealth. In November 2015, the unemployment rate stood at 6.2%. The currency in use in the country is the Swedish Krona after a referendum in 2003 rejected the Euro. Founded in 1668, the Swedish Riksbank is the world’s oldest central bank. 95% of the industries in Sweden are privately owned with the remaining percentage owned by the government. Major industries in the country include telecommunications, pharmaceuticals, motor industry, precision equipment, industrial machines, iron and steel forestry, home appliances, and chemical goods. Some of the major companies include Sony Ericsson Mobile Communications AB, Scania, Volvo, Electrolux, and IKEA among many others. Europe is one of the world's seven continents, and it is located in the north-eastern hemisphere. The continent is at times referred to Eurasia in combination with the continent of Asia due to the lack of distinct boundaries between the two. Europe consists of 50 independent countries and six countries with limited recognition globally. The continent has a Europe Day to celebrate peace and unity. The Council of Europe commemorates the day on May 5, while the countries of the European Union have the day set on May 9. This page was last updated on May 2, 2018. Sweden in WW2 – Was Sweden Neutral? When Did Sweden Become a Country?